Marquise-shaped diamonds have an infamous history that dates back to King Louis XV who, as the story is told, wanted a new diamond shape commissioned as a gift to his mistress Madame de Pompadour Jeanne-Antoinette Lenormant d’Etiolles, née Poisson. 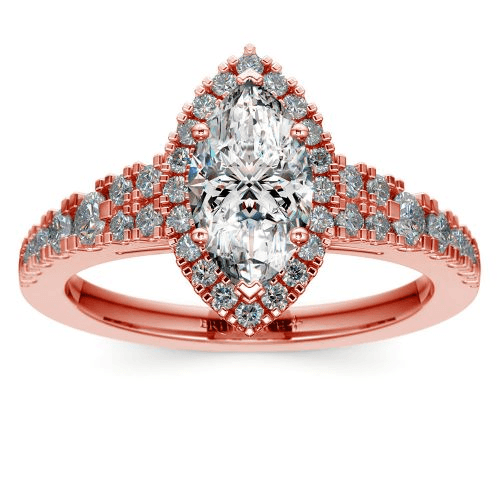 The shape, so the story goes, was styled to remind the King of his mistress’s lips.The King’s mistress was eventually given the royal title of Marquise, and her signature stone was named for her title. After the cut’s creation, the shape was known by other names before its official royal-blooded moniker. Marquise-shaped diamonds also are known as the Navette—which is French for ‘weaver’s shuttle’ or little ship –the football cut, and the eye-shaped cut. A Marquise called by any other name, however, is still the same stunning shape, and this elongated design creates a spectacular centerpiece for an engagement ring, brooch or pendant. When buying a Marquise stone, there are a number of guidelines to consider. Consider the 4 Cs of diamonds—cut, clarity, carat and color—all of which uniquely affect the Marquise cut. For the Marquise, cut proportions are extremely important. The length to width ratio of the stone should be around 1.7:2.0. If the width overwhelms the length, the stone will look too chunky and will appear poorly cut. If the length overwhelms the width, the stone will appear too thin and look emaciated on the hand. As with other longer cuts of diamonds, Marquise diamonds are prone to the ‘bow-tie’ effect within the center table of the stone. This effect is exactly as the name implies; when the light hits the table at a certain angle, a bow-tie shaped light trap will appear within the center, dulling the brilliance of the stone. 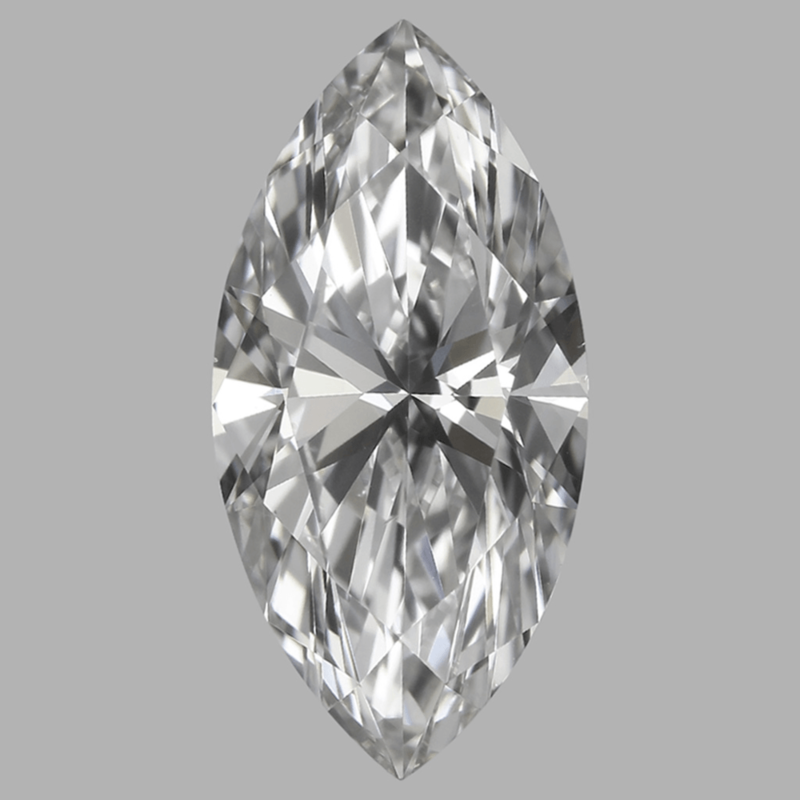 Like any stone, the Marquise can look cloudy and muddled as the clarity grade decreases. The prismatic shape of the Marquise allows these diamonds to reflect light beautifully, but the shallow depth of the stones allows inclusions to impact this brilliance more than in other shapes. Choose a higher clarity grade to ensure optimum fire and brilliance from the cut. Opt for VSI or VS2 if possible. Depending on the internal flaws noted, SI1 graded diamonds can reflect just as beautifully. When choosing a lower clarity grade, ask to see the flaws of the stone under a loop. Never be afraid to ask the jeweler to identify what flaws affect the grade. Stones that appear visually included or cloudy to the naked eye are poor quality and should be avoided. Elongated cuts give the illusion of a larger stone. For this reason, opt for higher grades in the other Cs and go lower on carat weight instead. Always invest in Marquise diamonds with high grades for cut, color and clarity before fixating on the carat size. If the budget still allows for wiggle room, then nudge up the carat weight for an even more impressive diamond. Like other elongated stones including the pear shape and oval cut, Marquise diamonds show color more significantly than round diamonds. Always select a higher grade for Marquise stones. If possible, select a color grade that rates Nearly Colorless (like G or H). If the budget doesn’t allow for a brighter color, set the stone in a yellow gold band to mask even a minute yellowish hue of a diamond. Light metals like platinum and white gold will magnify any color within a stone. Because of its association with vintage style, you might opt for a yellow gold setting and a lower color, especially if shopping with a strict budget. The slender Marquise gives the finger an elongated appearance, and the cut flatters most women. 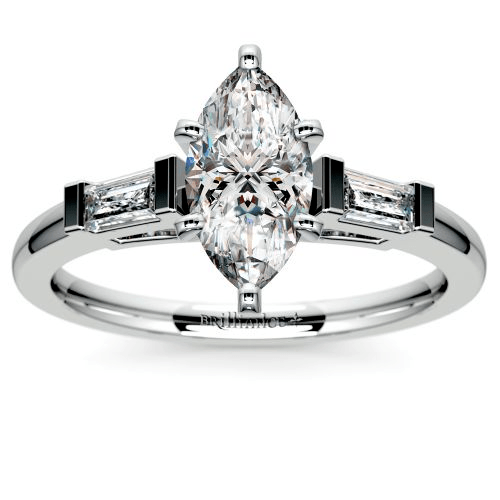 When selecting a setting, the Marquise stuns as a solitaire or with princess, trillion or baguette side stones. 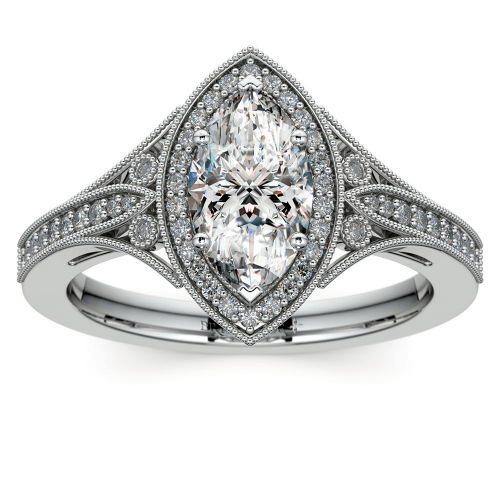 As mentioned before, the Marquise also pairs well with antique style rings, and the cut is often a found in vintage settings. Diamond or gemstone halos can be used with the Marquise, but the look can appear a bit overwhelming with the slenderness of the stone. Allow the slenderizing effect of the stone to shine through and select settings that highlight the Marquise. If a halo is a must, opt for a petite halo of diamonds. A supportive head mount for the stone is extremely important with a Marquise cut. The delicated, pointed tips of the stone are prone to chipping or breaking during everyday wear, so they must be protected by the setting. Always make sure that the mount features protective prongs at each end of the marquise to cover and shield the diamond’s pointed tips. Engagement rings featuring elongated stones as the centerpiece may be a bit more cumbersome to match up with a wedding band. Many wedding bands are made to accommodate the curvature of a diamond or the engagement ring. 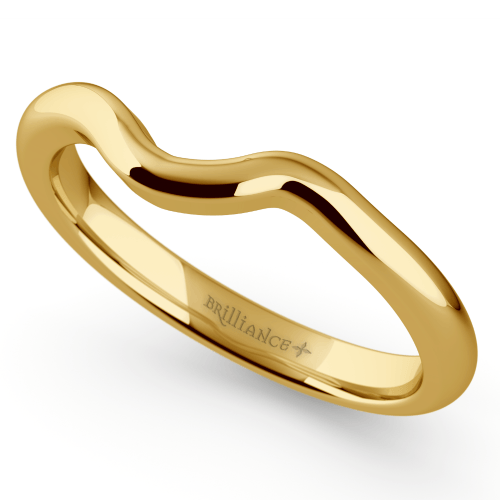 Unique wave-like patterned wedding bands or even bands with a central indentation may be designed to match up easily with any diamond shape and create a seamless wedding set. If you would prefer a straight band, be sure to get an engagement ring setting that lifts the stone high enough to allow a band to fit underneath the center mount for a flush fit. Inspired by the royal mistress of a French king, the Marquise cut is masterfully elegant, demure, yet surprisingly seductive. The flattering elongated shape gives the illusion of a larger carat weight while slenderizing the finger. Choose the Marquise for its storied Versailles grandeur, scintillating shape and belle époque Brilliance.